ugxvibe, msm0511 and Morty2264 like this. Amazon or Digital River (HTC)? Purchased straight through HTC. No financing. Mine shipped. 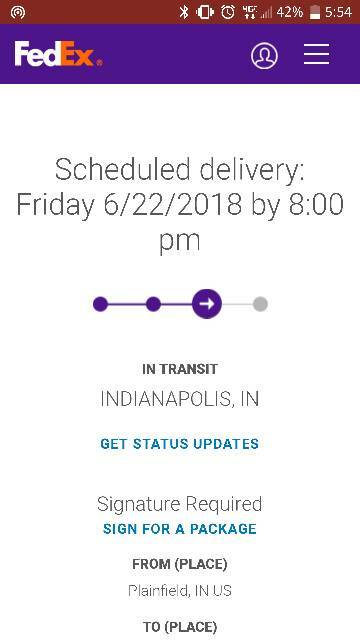 Says FedEx delivery for Friday! Bought through HTC. After my debacle with HTC financing I went through Amazon yesterday. Now it says backordered. Maybe they just haven’t got them from HTC yet, and it won’t take too long. Because that's the estimated date HTC would have given Amazon for fulfilling stock. 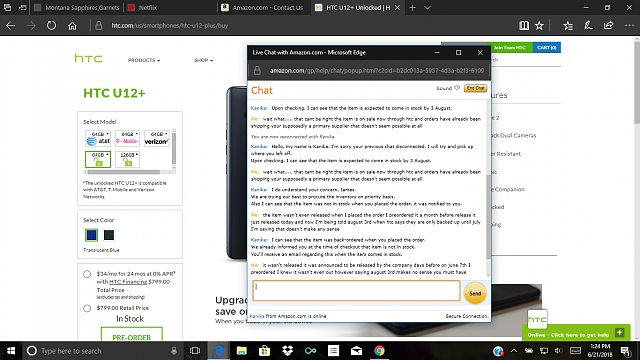 As 21st came Amazon didn't receive anything from HTC, but since HTC started shipping I would expect Amazon to receive the initial stock within few days. I’m assuming HTC is sending Amazon stock to them now that they’re shipping. Shouldn’t be too much longer. That’s what I’m thinking too. Amazon will probably get their stock in the next couple days. Heck I’ve waited this long, what’s a few more days? I just spoke with amazon, and the rep told me they didn't have an estimated date yet, so I'm not sure what's going on. Wow! They told me nothing is in stock. If I cancel my order then I might lose my spot lol. So they us to go with HTC.com? I get cheaper deal on shipping cost with Amazon. I spoke with an HTC rep through chat and he kept reiterating something about an investigation into all the cancelled orders, and apologized. When I told him the previous rep I spoke to said if I reordered I wouldn't lose my place, but the chat rep told me if I reordered today it would be July before it ships. When I mentioned not losing my place in line all he would say is that there is an investigation and HTC would know more next week. Then he told me I'd have to contact HTC instead of them contacting me about the results of said investigation. Amazon told me they didn't have any specific dates about when they would get stock. This is an unorganized mess. Well, I'm holding mine right now and I gotta say, wow! Been using it for the last 45 minutes and just wow. That is all for now. msm0511, Morty2264, Larry 609 and 1 others like this. Screen looks good? No yellow hue or light bleed or anything? Oooh nice! Post a pic of it when you can. No, none at all. The screen actually surprised me. It's not as dim as I thought it would be and it's so much better than the u11.